There has never been a more important time to be the best you can be in the public service sector. The Pew Research Center in U.S. Politics and Policy has been tracking public trust in government since 1958. In that more than 60-year span, never has public faith in government been lower than it is today. There’s a crisis of confidence in the workforce that manages our society; any mis-step is scrutinized and reviled. In the meantime, the challenges faced by the public sector are mounting… ballooning federal budget deficits leading to calls to reduce funding for government programs, public infrastructure that earns a D grade from the American Society of Civil Engineers, and record-low federal employment levels that are forcing existing staff to take on more and more. It takes enormous heart to enter public service in these circumstances, but also enormous diligence and expertise. There’s no margin for error and expectations are high. It takes dedication and confidence to enter the field today, and that’s why you need to look for the best education you can find to prepare yourself. You’ll notice that we put “NASPAA-Accredited” right up there in the title, and there’s a good reason for that. The Network of Schools of Public Policy, Affairs, and Administration (NASPAA) is the go-to specialist accreditation agency for public administration education. Their twofold missions are to ensure excellence in education and training for public service and simultaneously promote the ideals of public service. The tasks go hand-in-hand. The agency maintains the highest ethical standards for programs that apply for accreditation, even setting down rules around truth-in-advertising so you never have to worry about exaggerated claims of expertise or accomplishment when evaluating a NASPAA program. The agency is recognized by the national Council for Higher Education Accreditation (CHEA) and is a member of the Association of Specialty Accreditors (ASPA). The accreditation standards, which cover common topics like faculty qualification and hiring, academic processes and procedures, resource availability, and student learning goals, are all considered in the overall mission to vet and recognize the highest quality programs. That’s something you won’t find at most accreditation agencies, even specialty accreditors, and it helps explain why NASPAA’s Commission on Peer Review and Accreditation (COPRA) is a global standard in public service education. In turn, the agency knows that graduates from programs with such high standards will become standard-bearers themselves in the field of public administration. It’s a virtuous circle that you deserve to be a part of if you plan to enter public service. Accreditation is just a first pass for qualification, though. When you want the best, you go deeper than that, which is exactly what we did in evaluating the schools that ended up on this list. Concentration options are a big deal in public administration degrees. The field is so broad that a general degree can leave you woefully unprepared for the intricate and detailed subject matter in many areas of government. That’s why it’s important to have schools that can help you dive into the minutia of Homeland Security and Emergency Management, or Fiscal Administration, or Public Service Law. The more focused your education, the better prepared you will be to step up and make real contributions on day one. We looked for schools with interesting and unusual concentrations and list them out for you here to help you make your choice. Since research—both conducting it and learning from it—is important in making high-level decisions in government service, we also favored schools that have strong records of public administration research or who employ faculty known for their contributions to research and literature in the field. We also looked for funding to support those efforts, from high-quality organizations like Fulbright, the National Institutes of Health, and the United Nations. When major funders are willing to put their money behind a school, you can be sure it has been fully vetted and is performing work vital to the public interest. Flexibility is often a concern for students studying at the master’s level, so we looked for programs that offer online or evening/weekend courses as options. We also note when there are both full and part-time tracks, allowing you to take in information at your own pace. The ability to shift your education onto your own schedule keeps you on track with your own life so you don’t have to sacrifice personal growth for professional growth. Outcomes are important in any kind of schooling, so we tracked schools with high graduation and post-graduation employment rates. You can tell from the numbers what programs are most highly valued in the job market to factor that into your decision. And speaking of the job market, we also looked for schools that have strong partnerships with both corporate and governmental entities. The more contact you have with real-world issues and the people grappling with them, the better prepared you will be when you graduate… and the more contacts you will already have to help you succeed in service. Here you have our list of top picks for the 30 best NASPAA-accredited MPA programs in the country. Here you’ll find both public and private schools, located in every corner of the nation, with a wide variety of concentrations, faculty experts, and strengths. Each of these schools has something unique and special to offer to students of public affairs. If you’ve got the grit and determination to launch a career in public service, you can’t go wrong with any of the MPA programs on this list. An MPA that’s not only been nationally ranked but recognized on the international stage is one that deserves your attention. The Auburn University MPA earns a spot among U.S. News & World Report’s top public leadership and management programs and among its top public affairs programs, making it one of the best ranked in Alabama and the Southeast region. And on an international level, this program ranks among the top 200. This recognition is only fitting, given its fantastic opportunities for specialization, its dedicated faculty of esteemed researchers, and its environment rich in networking and research opportunities. Choose a formal specialization in Election Administration, Nonprofit Organizations and Community Governance, Community Planning, or Economic Development, and enhance your learning experience through exciting experiences like the Community and Civic Engagement Initiative and internships in overseas locations like Paris, Buenos Aires, Dublin, and London. With a prime location in the heart of downtown San Francisco and within the esteemed School of Public Affairs & Civic Engagement (PACE), San Francisco State University’s MPA is what a top-rated public administration grad degree looks like. Featuring a blend of hybrid and on-campus courses for the best in flexibility, a faculty of full-time, tenured researchers and scholars, and ample opportunities to specialize your program, either through a formal emphasis or a self-designed elective emphasis, the MPA here is everything you’re looking for in a comprehensive course of study. As a student of PACE, you’ll study in an interdisciplinary environment that emphasizes social justice and sustainability while you benefit from an extensive alumni network of more than 5,000 around the globe. There is, perhaps, no better place to earn your MPA than in the heart of Silicon Valley. San Jose State University is where future leaders and change makers head for the most contemporary and relevant education in public affairs, so it comes as no surprise that this university holds the distinction of being the top supplier of education, engineering, computer science, and business graduates for Silicon Valley. It also ranks among the top master’s-level public universities in the West by U.S. News & World Report. The MPA mirrors the university’s commitment to excellence, offering students a comprehensive and interdisciplinary course of study that includes exciting opportunities to study related areas like political science and urban planning. The MPA Advisory Committee here consists of leaders in the public and nonprofit space, who provide guidance on curriculum development to ensures students are exposed to the most relevant and contemporary issues in public administration. And with an extensive alumni network of more than 226,000 (75% of whom work in the Bay Area), you’ll enjoy outstanding support, as a student and long after graduation. A list of top MPA programs wouldn’t be complete without a nod to the University of La Verne, which scores points not just for its innovative curriculum and U.S. News & World Report ranking among the top public affairs graduate programs in Southern California, but also for its focus on the needs of adult learners. Choose the La Verne MPA and you’ll enjoy a flexible curriculum that’s designed specifically for working professionals. Most of the courses of the program are offered in the evening, on-campus, while some are also offered in a hybrid format that combines online study with field research. The program’s year-round curriculum allows you to start the program in the fall, winter, spring, or summer. You’ll also benefit from this program’s emphasis on individual attention to each student, which includes plenty of valuable contact and communication with instructors committed to public service. Expect to venture outside of the classroom as you take part in unique experiences that include an elective travel course, applied project opportunities, ASPA dinners with elected and appointed officials, and other support activities that promote diversity in local government. An MPA program is only as good as the school in which it’s located. Which is why you can count on the University of San Francisco’s MPA, located in the esteemed School of Management, to position you for success. With an enviable location in the heart of San Francisco, one of the most dynamic business networks in the world, the School of Management is able to offer its MPA students opportunities for outstanding real-world learning experiences. A low 15:1 student-to-faculty ratio that ensures a close-knit and highly engaging learning experience for each student…superb opportunities for service learning and community involvement…and the opportunity to complete the program either online or at the university’s downtown campus – these are some of the key features that make the USF MPA one of our top recommendations. We’re certainly not the first to bring attention to this program: for four consecutive years, the MPA at the University of San Francisco has ranked among U.S. News & World Report’s ‘Best Grad Schools in Public Affairs’. The University of Colorado, Colorado Springs has managed to produce a program that hits the mark on every level. Located in the UCCS School of Public Affairs, arguably one of the top schools of public administration in the Rocky Mountain West, the MPA is large enough to secure a world-class faculty of experienced practitioners and researchers yet small enough to produce an intimate learning experience that’s rich in communication and collaboration between students and faculty. And with a finger on the pulse of the needs of today’s busy grad students who demand flexibility, the MPA is offered entirely on-campus, entirely online, or a combination of the two. The program can even be custom tailored to align with your career goals by choosing from one of five graduate certificate options. The Trachtenberg School’s MPA and MPP are fine examples of George Washington University’s commitment to outstanding scholarship. As one of just a few universities in the nation to receive NASPAA accreditation for both its MPA and MPP programs, George Washington offers students the option of focusing their graduate course of study on management, leadership and administration (MPA), or policy research and analysis (MPP). By choosing a field of study, your MPA or MPP instantly becomes a personalized course of study that matches your career goals. As a student of either program, you’ll enjoy an environment rich in rigorous research and hands-on learning. From school conferences to the student-faculty retreat to community service outings to public policy research luncheons, you’ll enjoy ample opportunities to leave the confines of the classroom and engage in your community while learning about new developments in practice and cutting-edge research. The Trachtenberg School of Public Policy and Public Administration is one of just a handful of public affairs programs in the nation to publish a student journal (Policy Perspectives) that showcases student research. Governors State University’s commitment to civic engagement pairs perfectly with its MPA program, a robust program designed to prepare the next generation of leaders and innovators in civil service and public policy. Earn your MPA here and you’ll enjoy outstanding opportunities to engage in scholarly activities and community service, both of which will provide you with unparalleled practical knowledge in the public, private, and nonprofit sectors. Governors State is home to the Center for Civic Engagement and Community Service, a central hub for service opportunities and civic engagement activities. Because of its location near Chicago’s southland region, many of the projects and activities are focused on promoting the social and economic development of the region. If you want to extend your service learning reach, the university’s Civic Engagement & Community Service Center has partnered with the Office of International Service to provide a unique service learning opportunity in Nicaragua. And thanks to online and on-campus/off-campus evening courses, you’ll have the flexibility you need to earn your MPA while enjoying a host of hands-on experiences. Northern Illinois University was one of the first universities in the nation to produce an MPA program worthy of NASPAA accreditation. Today, this comprehensive course of study still hits the mark, seamlessly integrating theory and practice for both pre-career students and mid-career professionals looking to take their careers to the next level. You’ll love this program’s executive format that features convenient evening classes that meet just one night per week for eight weeks. You’ll also appreciate the program’s six specialization options, which allow you to complete a course of study that best matches your personal and professional goals. With outstanding paid internship opportunities available and an esteemed, interdisciplinary faculty, it’s no surprise that the MPA boasts a 95% job placement rate among grads. Few universities can offer what UIC manages to do so effortlessly with its MPA at the College of Urban Planning and Public Affairs— providing grad students with not only a degree, but with a truly immersive educational experience that turns students into public policy experts capable of bringing solutions to the most pressing urban challenges. What does this mean for you? An engaging experience supported by exciting, real-world learning opportunities afforded to you by the ultimate urban laboratory – the Chicago metro area itself. Your graduate education will be supported by UPPA’s nine research centers and institutes, a faculty of talented professionals in education, research, and service, and exciting experiences elevated by valuable collaborations with university partners. With backing from renowned foundations like the Woods Fund, the Ford Foundation, the Rockefeller Foundation and the U.S. Department of Justice, it’s no wonder that the university’s public administration department faculty’s research productivity is ranked fifth in the nation. You won’t find a cookie-cutter public administration curriculum at the Kansas State University Department of Political Science. Instead, the MPA here features a flexible curriculum that allows you to develop an area of emphasis that best matches your professional goals and interests — you’ll choose from the program’s pre-designed emphases or create one based on your choice of electives. With just 15 new students accepted each year, the KSU MPA is a small cohort program that offers outstanding opportunities for collaboration and communication for a truly engaging experience. Online and evening courses are seamlessly integrated to produce a curriculum that’s designed specifically for the adult learner, so whether you’re a college grad or an administrative professional interested in taking your career to the next level, Kansas State’s MPA has what you need for success. And it’s not just lofty promises here – this program is backed by an impressive 96% job placement rate among graduates. Since its doors opened in 1958, the University of New Orleans has served as a major business driver in metro New Orleans, contributing to industry and the economy of the region and beyond by producing outstanding, contemporary programs like the MPA, one of just four public administration programs in Louisiana to hold the esteemed NASPAA accreditation, and one of just two to earn a top spot in U.S. News & World Report rankings. As a student of the MPA, you’ll benefit from a distinguished faculty with special expertise in hazard policy, nonprofit leadership, and transportation administration…convenient class schedules that feature some online coursework…and the opportunity to specialize your degree in either nonprofit leadership or hazard policy. This flexible, professional program is limited to about 30 students, providing professionals like you with an intimate, collaborative learning environment. 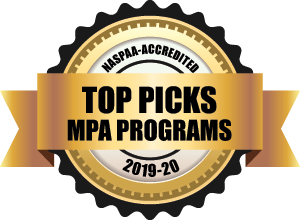 As the first program in the state to receive NASPAA accreditation, the University of Baltimore’s MPA is a leader in top-notch graduate education in public administration. It’s no surprise, then, that this program earned itself a top spot among U.S. News & World Report’s list of ‘Best Grad Schools’ in 2019. If you’re looking for a program that’ll prepare you for a career in public administration, look no further; the MPA comes complete with excellent internship opportunities and a number of fully funded fellowships available through the university’s Schaefer Center for Public Policy, the research and consulting arm of the College of Public Affairs. The Center is Maryland’s preeminent applied research and policy analysis center, offering opportunities in research and technical projects sponsored by local, state, and federal governments, nonprofit organizations, and other enterprises. Do you need a flexible program that allows you to earn your grad degree while still maintaining your professional obligations? The MPA has you covered there too, offering online course delivery or convenient evening and weekend classes in Rockville. With a 41-year history of producing leaders and innovators in public administration, Central Michigan’s time-honored MPA delivers an education that’s backed by an esteemed faculty with years of public service experience and scholarly accomplishments (program faculty has published in the top journals in public administration, including Public Administration Review and American Review of Public Administration). A robust curriculum that comes complete with case-based class experiences, and opportunities to study abroad, the CMU MPA offers an unmatched student experience. This program also understands that today’s learner often needs a flexible course of study, which is why courses are offered on-campus, in the evenings and on the weekends, and online, allowing busy professionals like you to study anytime, anywhere. This customizable course of study comes with your choice of a general concentration, a concentration in state and local government or nonprofit management, or a graduate certificate in nonprofit leadership or citizen engagement. Grand Valley State University’s MPA has held the esteemed NASPAA accreditation for more than 20 years, so it comes as no surprise that nearly 91% of all students in this rigorous and contemporary course of study are employed at graduation. Known for its diverse student body and supportive faculty, the MPA features a flexible curriculum that includes both full- and part-time options and online, evening, and weekend courses. Whether you’re a new grad or a current administrative professional, Grand Valley State’s MPA is designed to accommodate your career goals by offering your choice of five concentrations, a variety of internship opportunities, and a host of interdisciplinary electives. Oakland University’s MPA makes its mark among public administration master’s programs, not just for its rigorous curriculum and personalized approach to preparing public policy officials, but also for the distinct educational experience found only at Oakland. Earn your MPA here and you’ll benefit from the university’s state-of-the-art facilities and classroom technology, outstanding research opportunities with corporate partners, and hundreds of established partnerships with Fortune 500 companies, governmental agencies, hospitals, educational institutions, and more. This university has long been touted for its excellence in research and scholarship, earning recognition from the Carnegie Foundation for the Advancement of Teaching for being among the nation’s top doctoral research universities. As an MPA student, you’ll enjoy small class sizes, your choice of five specializations, exciting opportunities to participate in the department’s Model United Nations team and attend faculty research forums, and unique study-abroad experiences that span six continents. Western Michigan University’s MPA is what excellence in graduate-level public policy education looks like. This comprehensive and rigorous NASPAA-accredited program enjoys a location within the university’s esteemed School of Public Affairs & Administration, which boasts an alumni network of more than 3,000…a dedicated faculty that lends its expertise to nonprofit boards and public agencies…and research supported by national and international organizations like Fulbright, NIH, NSF, and the United Nations. The MPA here is anything but standard, offering students the option of choosing an area of concentration that best fits with their professional goals, along with opportunities to engage in faculty-led research in areas like leadership, ethics, intergovernmental relations, comparative public administration, and more. As a student of the University of Minnesota MPP program, your options for a truly personalized educational experience are nearly endless. Choose from one of seven pre-designed concentrations or design a concentration that best suits your professional goals and personal interests – the choice is yours! Many students of this program create an interdisciplinary concentration by combining courses from two or more concentrations, or even from other departments in the university. As a student of the MPP, you’ll benefit from the Humphrey School’s focus on social justice and human rights and its expertise in the areas of global policy, leadership and management, politics and governance, social policy and analysis, and urban and regional planning. As such, you’ll be encouraged to investigate the many research centers at the school to find a match for your professional interests. Whether you’re preparing for a career in local government, the nonprofit or corporate arenas, or as a policy analyst, the University of Missouri’s MPPA will get you where you want to be. Backed by a ranking that places it among the top third of all graduate public affairs programs in the U.S. and as the highest ranked program in St. Louis, according to U.S. News & World Report, the MPPA’s success isn’t just touted – it’s proven. And with NASPAA accreditation under its belt and a unique combination of public administration and policy analysis courses, the MPPA here will sharpen your skills in areas like organizational behavior, statistics, budgeting, research methods, and more to position you for exciting leadership positions. Plus, it’s perfectly designed for working professionals like you, thanks to evening and weekend classes. If you’re looking for outstanding options for a graduate-level education in public affairs, look no further than Kean University, which offers no less than three master’s degree programs in public administration. Choose the Public Management MPA if you want a generalist program focused on areas like budgeting and human resources; choose the Health Services Administration MPA if you’re interested in a leadership position in health services organizations; or choose the Nonprofit Management MPA if you’re looking to hone your skills for a management position in nonprofit organizations or other organizations that regulate or fund nonprofits. Kean also enjoys a reputation for its outstanding internship opportunities. In fact, thanks to its location just 30 minutes from NYC, students here have enjoyed valuable internships with Fortune 500 companies like BMW, Price Waterhouse Cooper, Giorgio Armani, and Johnson & Johnson. Since 1969, the University of New Mexico’s MPA has produced more than 1,600 leaders and change makers in the field of public administration. Today, this time-honored program continues to impress, earning it a place among the top public affairs grad programs in the nation by U.S. News & World Report. And it’s no surprise; along with holding the esteemed NASPAA accreditation, this program is home to a highly dedicated faculty who bring their expertise in areas like organizational behavior, public policy evaluation, and health policy and management to the classroom. The MPA here is customizable, allowing you to choose a concentration that best matches your career goals. And if you’re a recent college grad, you’ll be impressed with this program’s internship opportunities that have included the State of NM Department of Finance and Administration, the Colorado Department of Transportation, the Albuquerque Police Department, and United Way of Central New Mexico, to name just a few. The New School’s MS in Public and Urban Policy is innovation defined. Housed within the Milano School of Policy, Management, and Environment, which is renowned for its distinctive approach to blending critical theory with hands-on learning and its emphasis on addressing complex, real-world problems, the MS in Public and Urban Policy offers a collaborative and supportive environment, 11 options for program specialization, and a flexible course of study that includes a fast-track path (16 months accelerated), a traditional, full-time path, and a part-time path. Mirroring the Milano School’s focus on real-world learning, this program prepares you to deftly tackle the world’s most complex problems by engaging with public officials, nonprofit leaders, and private-sector executives and through a curriculum that includes case analyses, computer-based problem sets, and real-life policy and management problems, all within the nation’s largest real-world laboratory—NYC. Wright State University’s MPA is a leader in southwest Ohio and one of the top programs in the nation. Along with holding NASPAA accreditation, this program boasts an engaged and experienced faculty, an innovative curriculum that’s designed to accommodate all students, from recent graduates to mid-level professions, and an alumni network of innovators and leaders in local, national, and global leadership positions. As a student here, you’ll appreciate the flexible curriculum, which includes courses that meet just one evening a week, and the many internship opportunities. Plus, you’ll have access to exciting employment and assistantship opportunities through Wright State’s Applied Policy Research Institute and the Department of Urban Affairs and Geography. The University of Oregon’s MPA has recently garnered attention from organizations like the Emerging Leaders in Local Government Network and the Association for Public Policy Analysis & Management, and for good reason. This rigorous and contemporary program has the esteemed NASPAA on its list of accolades, along with everything you’d want in a grad program: A supportive environment that includes small class sizes and an engaged faculty… a customized course of study that includes your choice of 12 pre-designed concentrations or a self-designed concentration…an emphasis on applying classroom learning to real-world policy and management issues…exciting research options that include working with the Sustainable Cities Initiative and the Institute for Sustainable Environment and participating in faculty-led research projects…and a superb location in Oregon, which boasts a long and distinguished record of policy innovation. You’ll love West Chester University’s MPA for its rigorous curriculum and for its flexible program options. Designed for both pre-service and in-service students, the MPA here is designed to provide you with the skills you need to serve as an innovator and leader in the administrative process, whether for the public or private sector. Plus, it’s offered as an online, teleconference, and on-campus program, thereby providing working grad students like you with the flexibility you need. And there’s no guessing about this program’s excellence—it’s been consistently ranked among the top public schools in the North, the best colleges for veterans, the best regional universities, and the best value schools by U.S. News & World Report. With a 37-year history of producing tomorrow’s leaders and public servants, the University of Texas at San Antonio MPA enjoys a proven record of success. It’s also one of just ten programs in public administration in Texas to hold the esteemed NASPAA accreditation. Choose the University of Texas at San Antonio for your MPA and you’ll be part of a student body 32,000 strong at a distinguished institution that’s also the largest in the San Antonio metropolitan region. What does that mean for you? Unparalleled opportunities and options, including flexible scheduling and evening courses at the downtown campus…outstanding research opportunities that address the most pressing issues in public administration…and superb student support through the Office of Student Academic Success. The University of North Texas MPA is well deserving of its spot among the best MPA programs in the nation and we’re certainly not the first ones to feel that way: U.S. News & World Report has recognized it as the top MPA program in Texas and throughout the Southwest, and ranks it 13th in the entire nation. As a student here, you’ll enjoy close communication and collaboration with a dedicated faculty, along with the support of an internship coordinator who helps you secure an internship and then monitors your progress throughout the course of the internship. You’ll have expert guidance as you choose or design a specialization that best fits your career goals and personal interests. You’ll also benefit from the school’s focus on research, which allows you to participate in faculty-led projects in areas such as cultural competency, capital and operating budgeting, ethics, and human resource management. Choose from a variety of online and on-campus courses and then specialize by choosing from among the many available electives – this is customizable graduate-level education at its finest! The Southern Utah University MPA is rigorous, versatile, and flexible, offering a comprehensive, NASPAA-accredited program in a collaborative and supportive environment. You’ll appreciate this program’s option for online or on-campus study, as well as the option to choose a specialization in areas that address the most pressing and relevant topics in public administration today, either State and Local Government or Higher Education Administration, or custom tailor your curriculum through a choice of electives. George Mason University’s MPA earns a spot among the top MPA programs because of its top ranking in national and international circles. In fact, according to the Academic Ranking of World Universities, this program was ranked 13th among U.S. public administration programs. The MPA program at George Mason is also one of the largest in the country, affording students like you access to a massive alumni network that numbers in the thousands and a program faculty that includes no less than 14 renowned scholars and practitioners. As a student here, you’ll also be able to tailor your grad program by choosing a pre-designed concentration or by working alongside an advisor to create a concentration that best matches your personal career goals and interests. You’ll also benefit from this school’s prime location in the Washington D.C. area, providing you with unparalleled access to leading scholars and practitioners in policymaking and public service. The national rankings paint a picture of Seattle University’s rigor and excellence: U.S. News & World report ranked it among the top 10 in the West for 18 consecutive years and among the ‘Best Graduate Schools’ in 2018…the Wall Street Journal/Times Higher Education ranked it among the best colleges and universities for producing successful graduates in 2018…and Bloomberg Businessweek recognized it for everything from its commitment to sustainability to its undergraduate programs. The MPA here continues this legacy of excellence, providing students like you with a comprehensive course of study, whether you’re a mid-level manager or a recent graduate. Just some of the highlights of this program include a faculty of active scholars and practitioners, a superb network of faculty, alumni, and community leaders, and the opportunity to join the U.S. Presidential Management Fellows program, a prestigious, two-year training and development program with placements in top U.S. government agencies. You’ll also appreciate the university’s prime Seattle location that offers up fantastic opportunities for service learning. Just some of the internship opportunities have included the City of Seattle, King County, Sound Transit, the City of Bellevue, and Enterprise Community Partners.